Tchefuncta Club Estates was established in 1956 by a group of professional men and women originally seeking a place for weekend homes and campsites. Pooling together their funds they purchased a tract of land on the Tchefuncte River known as “Emfred”, belonging to the Suter family from Bogalusa. 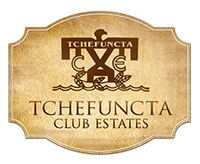 There was such enthusiasm for developing the land as full-time home sites that the weekend concept was set aside and Tchefuncta Club Estates was born. The original 246 homeowners drew names from a hat to select their home sites and volunteer committees began work on different aspects the community, including the countryclub, golf course, nature trails, marina and public places. Neighbors’ working together to improve and maintain their community is a hallmark of Tchefuncta Club Estates. Streets were named for birds, trees and flowers. By 1959 the streets were complete and water, sewer and the very first underground power lines in the state were in place. Tchefuncta Country Club opened in 1961 on land leased to them by the Estates. In 1969 the course expanded from nine to the current 18 holes. Over a half century ago an idea took shape. The dream was not about profit or progress, but 900 acres of preservation and pride. Friends became neighbors when they banded together and purchased this virgin land along the river. Then, as today, each property owner is a stockholder in the community – molding the future, preserving the past. The dream endures and flourishes as Tchefuncta Club Estates, a unique private enclave defined by those who call it home. Tchefuncta Club Estates is located in Covington, Louisiana on Highway 21 between I-12 (exit 59) and Madisonville in St. Tammany Parish.